The good decisions we make in life sometimes lead us into the path of success. Like many others this is a story of success. It all began when young Margarida arrived in Estremoz and fate dictated it would be there she would find the love of her life, Joaquim Cabaço, descendant of the Cabaço family. Joaquim early learned the art of the fields and vineyard and it was him together with his wife that planted the current vineyard, in 1992. Back then and lacking own wine production or winery all the grapes were sold to producers from the region. 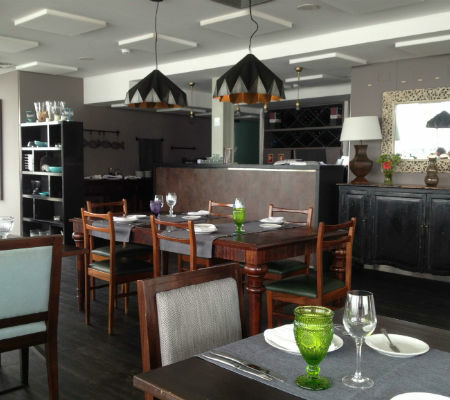 On another hand Margarida’s passion by cuisine led her to open one of the Alentejo cuisine temples, São Rosas Restaurant. At some point, and despite all the art and mastery that she puts in her kitchen Margarida felt the need to complement it with something that also had her hand. And so, along with the 2001 harvest the Monte dos Cabaços project was born and the grapes that were previously sold now gave birth to the couple’s first wine, interestingly it was one Syrah produced from a vineyard with three years. From a total of 130 hectares of vineyard, 55 are destined to Monte dos Cabaços project and the rest for their son Tiago Cabaço. 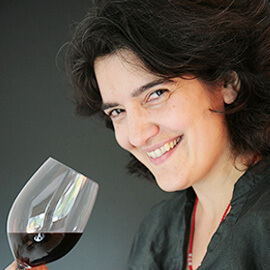 Nowadays the range of wines is grew and is broader, the winemaking is in charge of winemaker Susana Estéban but Margarida Cabaço always has the last word. The selection process starts in the vineyard just as she does with the products that she selects for São Rosas, the quality criteria is always present. The best blends are entitled to age in casks and when they show a higher level they are used for Monte dos Cabaços Reserva. As for the special range of wine named Margarida (which I will not approach for now) are made with the best grape variety of each vintage. The first wine was made in 2005 and nowadays we taste Monte dos Cabaços 2013, which is composed by the Antão Vaz, Arinto and Roupeiro grape varieties and is aged in stainless steel. Shows very ripe and vigorous fruit (citric, apple), lemon tree’s green leaf and white flowers in a direct and forthright set that has some nerve. In the mouth it shows somewhat tense, there’s a balance between the ripe and juicy fruit and the dryness, it’s fresh and has a good finish. 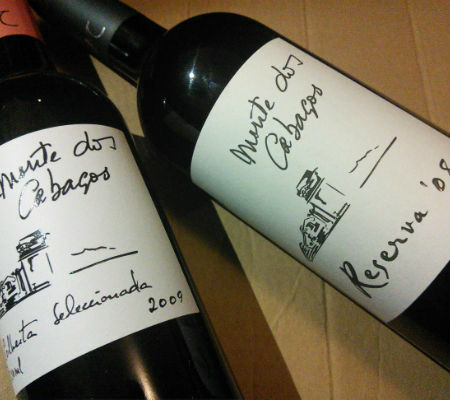 Now the reds, Monte dos Cabaços Colheita Seccionada 2009 is centered in ripe fruit, berries and forest fruits, some plum, notes of black chocolate, tobacco, black pepper, fresh and good intensity. Well-structured set, tasty mid-palate and a long finish. 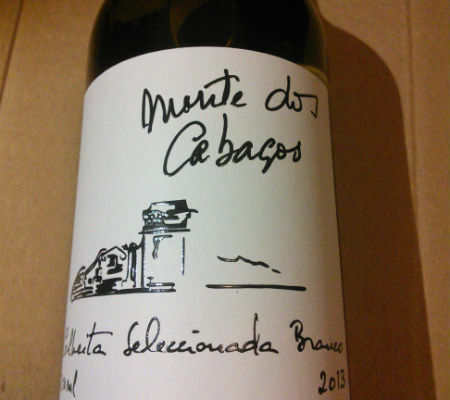 For last but not the least is Monte dos Cabaços Reserva 2008 that aged in casks and was made with Touriga Nacional and Alicante Bouschet. An attractive and serious wine with very ripe black fruit wrapped in freshness and some jam, good set harmony with hints of spices and very good concentration with the wood very well integrated. Very engaging and at the same time showing nerve and grab, some austerity even, which is felt in the background. 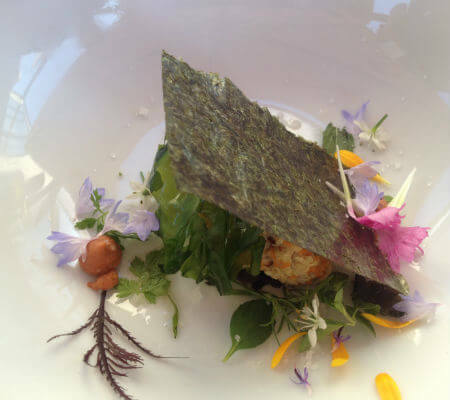 In the mouth there’s a festival of sensations, nerve and freshness with a firm structure the grants it longevity and a fantastic performance at the table. 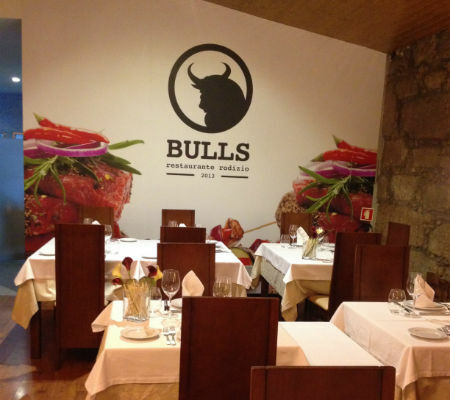 Throughout the last few years, a number of places in Douro have emerged that specialise on serving good food, with quality, and using genuine products that have earned a safe spot on the market and are now sought after by both Portuguese people and foreigners. This is also thanks to the word spreading on social media, which is nowadays an ever more valuable and easily accessible tool. In Ervedosa do Douro, a small village on the side of the road that climbs from the river bed up to S. João da Pesqueira, one of those places opened a few years ago, called Toca da Raposa [“The Fox’s Den”]. Right on the side of the road, but with plenty of parking space in front, we are welcomed into a very cosy and welcoming place. It’s well decorated, sober, and with very good taste. 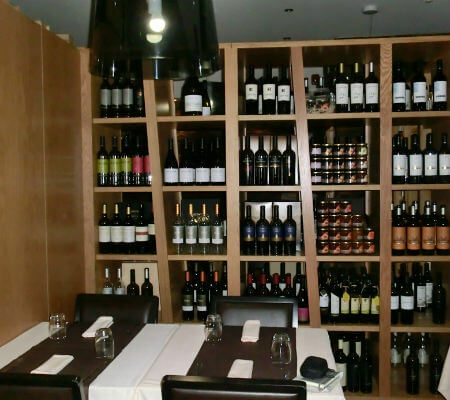 A few tables stand at the entrance; then, you see a broad counter and a few more tables, a wooden floor, some wooden walls and others in schist, many shelves filled with bottles of wine, which they also work very well with here. The mother directs the kitchen like a pro, her hands making pure magic at times; the daughter runs the room with knowledge and good taste, presenting the dishes and proposing high-quality wines to go with the meal. 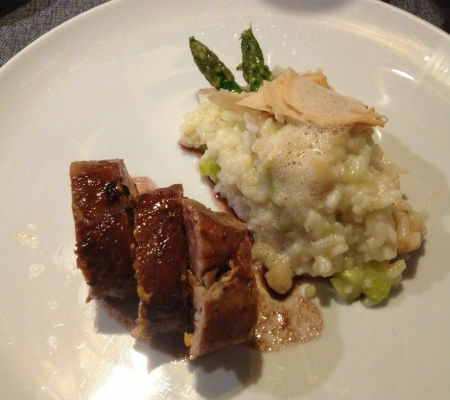 Douro wines naturally cover most of the menu. 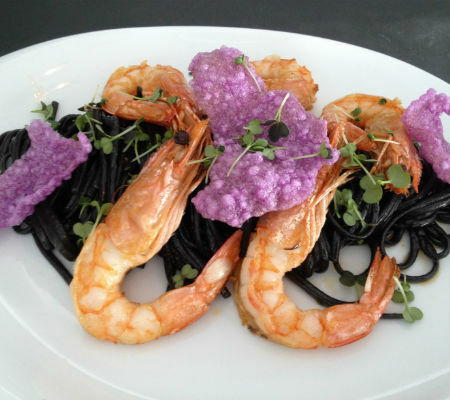 The result is always magnificent, offering visitors well-presented intense meals with plenty of variety, from appetisers to more elaborate main courses, with balanced seasoning on perfectly-cooked food that always enhances the quality of the products used. After selecting the food, when we shift to the choice or choices of wine, we can always count on the daughter to show us the wines on the shelves and in the long list; they are not there just by any chance. You can tell she is a knowledgeable, enlightened person who knows the wines, where they come from, their characteristics, and the many harmonisations that come through with the different dishes on the menu. 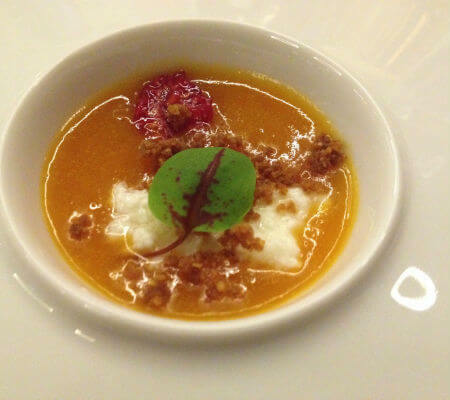 This is not unrelated to the fact that many producers of the Douro region – and that area especially – come by to eat. S. João da Pesqueira is the municipality of this region with the highest amount of Douro wine producers. 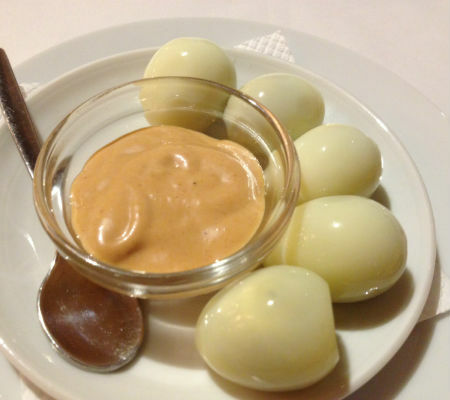 On our last visit, after we were comfortably sat at our table, we nibbled on a few toasted almonds that came with a 10 Year Old White Port by Andresen, served at the right temperature. Very good. 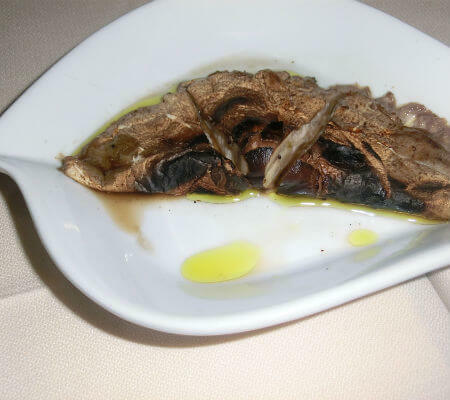 Immediately afterwards, a delicious regional bread was served with very well-prepared appetisers: very tasty míscaros mushrooms (man on horseback/yellow knight) grilled with olive oil, and fried octopus filets with soft batter. 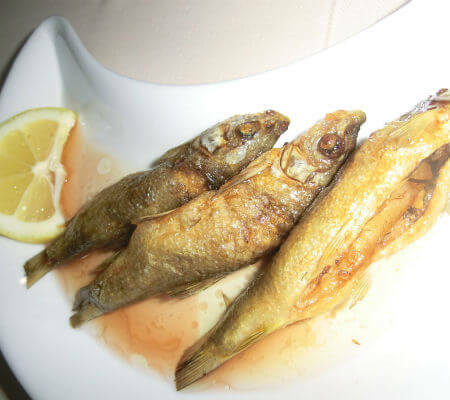 Then, delicious small river fish fried in pickling brine, a delicious toasted alheira with a slightly sharp taste and a crunchy skin, served with sautéed plump greens. 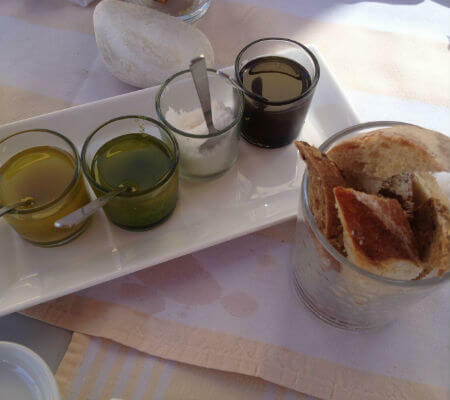 To close the session of appetisers and “watermill flavours”, we had toasted regional bread with olive oil, presunto, and cheese in olive oil. Excellent! So far, we had drunk the white Gambozinos Reserva 2013, that was always level with the food; we moved on to a red, Beira Douro Colheita 2012, both charged by the glass. 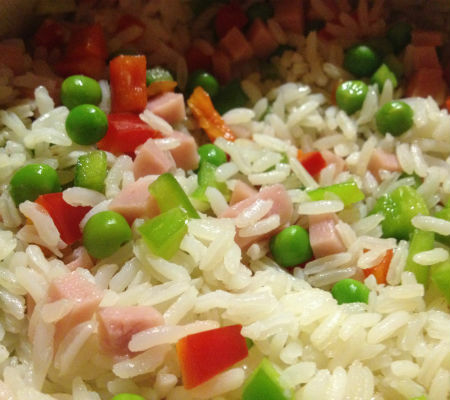 The red made a good accompaniment for the míscaros rice – prepared to perfection, creamy and tasty, with grilled, thin Bízaro-pig steaks from the neck. 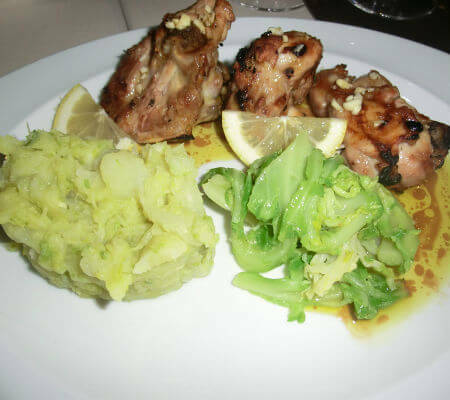 And we still had grilled kid with stewed potatoes and sautéed cabbage – very well cooked countryside food. 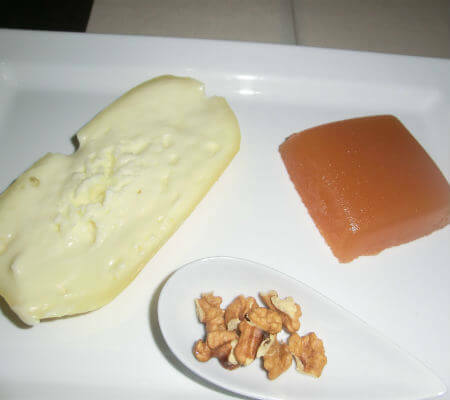 Already pushing it, but with a 2008 LBV Port by Noval in our hands, we started on the almond pie, egg pudding, a mountain cheese with quince jam, and nuts, which left us exhausted… but delighted. 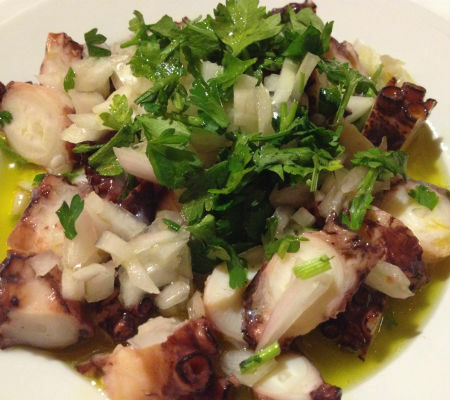 Gaveto restaurant started off as a seafood eatery in Matosinhos – yet another one. It was bought by Manuel Pinheiro in 1984. 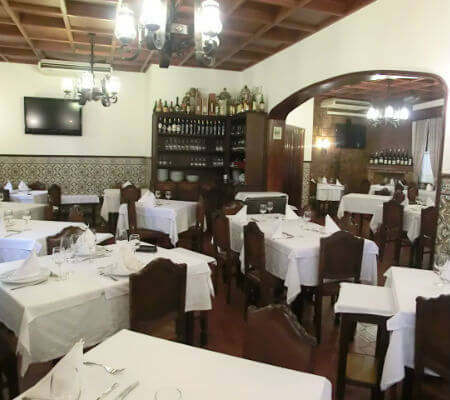 From then onwards, they carried on serving seafood, but the place was turned into a more comfortable restaurant with good traditional Portuguese food. 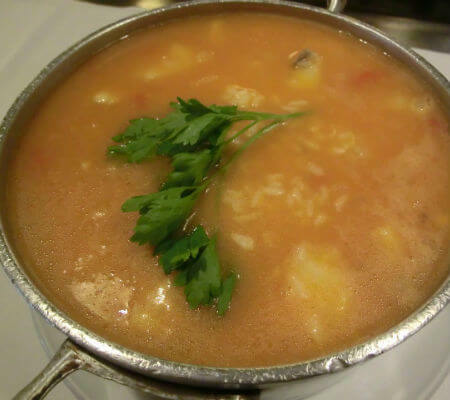 The list of clients gradually grew, and the restaurant was always very busy, which was the result of not only the friendliness and professionalism that the owner always demanded of his staff, but also thanks to the extremely high-quality products used in the many dishes they offer. 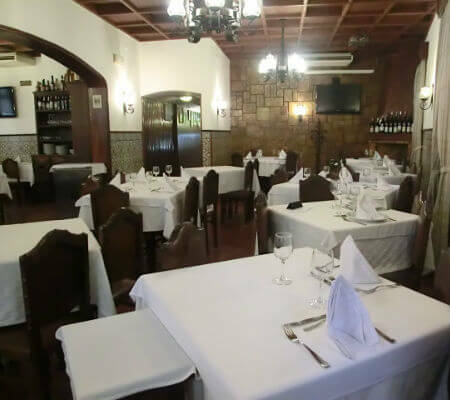 Those values were passed onto Mr. Pinheiro’s children, who despite having studied unrelated subjects, made an early start at helping their father in the restaurant and in the guesthouse in Porto. The guesthouse has been transformed into a high-quality boutique hotel now managed by the daughter, Cristina. The eldest son, José Manuel, started working with his father in Gaveto (Matosinhos) almost from the start. Later, in 1995, they were joined by João Carlos, the other son. They put in a lot of work, dedication, simplicity, and a good relationship with both staff and customers, which grew constantly. Today, a huge amount of clients is composed of the two brothers’ friends and of regulars. The dad, Manuel, now retired, continues to pop in daily to offer one or two pieces of advice, but especially because he enjoys watching the success of his long-term project in the competent hands of his sons. 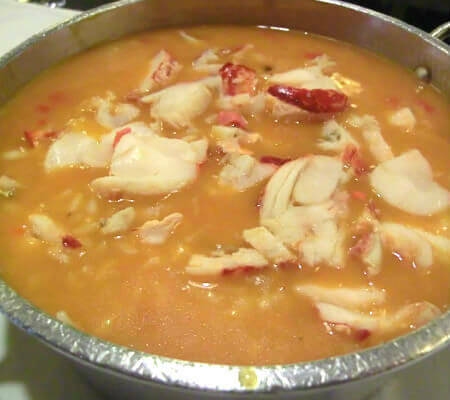 The seafood and fresh fish of the day are always available on demand, with extremely simple recipe books that allow the quality of the products to glow. 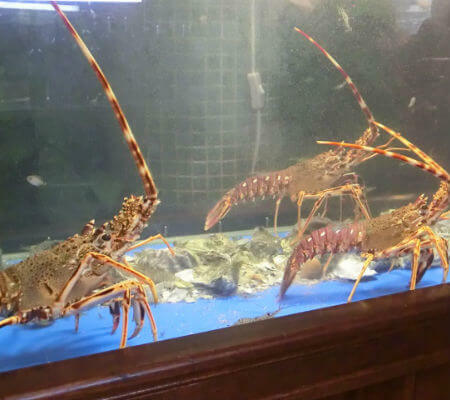 Two huge beds of live seafood at the entrance are guarantees of ocean freshness. 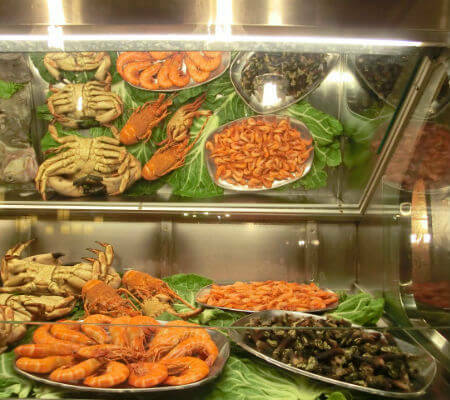 In addition, a huge glass cupboard displays some ready-boiled seafood and the many types of fresh fish, in plain sight. The giant tank, usually housing lobsters, will be hosting a lot of lamprey from January, the stars of the restaurant, which will also be alive. 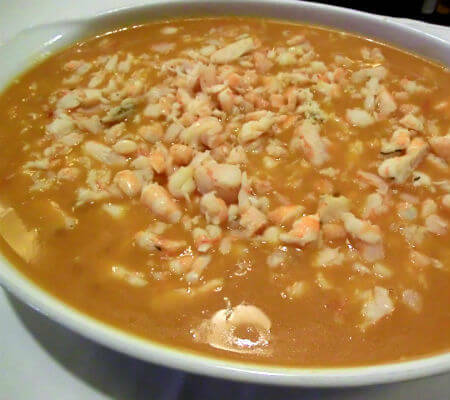 Cooked à bordalesa [Sliced, marinated in white wine and boiled in its own blood and vinegar, served with rice or toast] or in lamprey rice, they attract crowds of fans, who will not feel disappointed through to April. 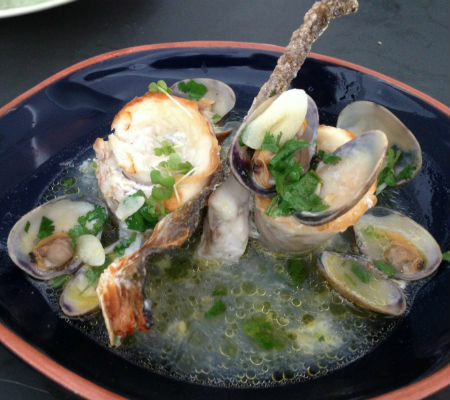 Also glowing in that season will be the shad – always cooked to perfection. 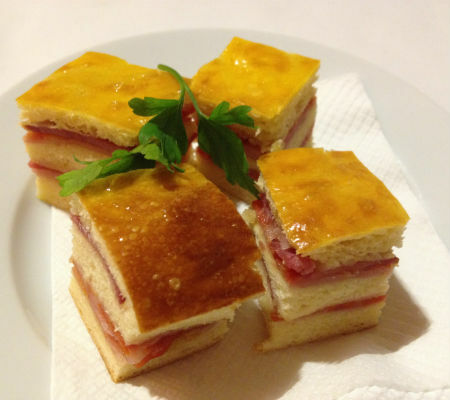 The snack-bar service is successful too; be it small appetisers, the delicious seafood soup, barbequed food on the bread and, of course, the traditional Francesinha (a Portuguese twist on the French croque-monsieur). To be enjoyed with an ice-cold, very well-pressed beer. 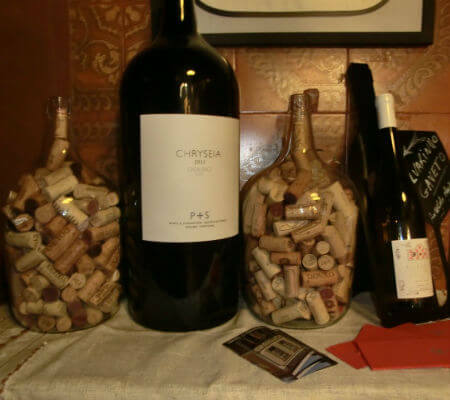 However, in the last few years, the wine service and supply has been building up a real passion to the point where the current wine list includes the biggest names in the country, and even a few very good foreign wines. 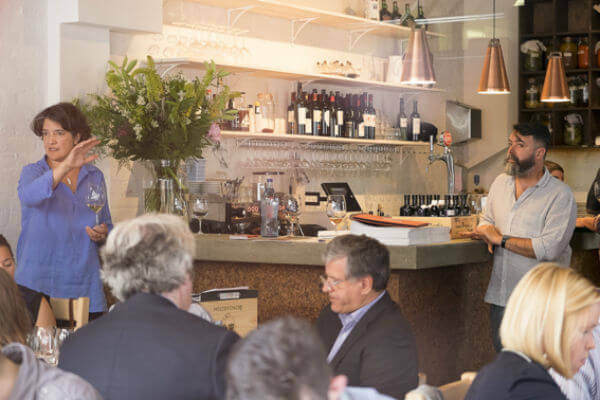 Many well-known national producers have become regulars; some are even friends with the two brothers and organise many tastings and presentations of their new releases and rarities. 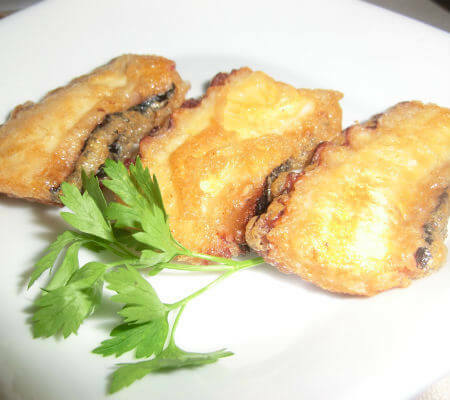 The latter make perfect matches with many of the dishes that have become compulsory choices for many of those very clients. 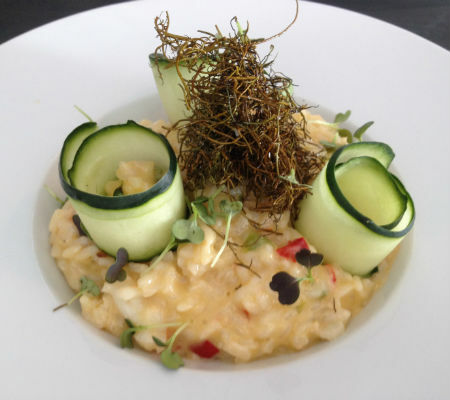 Besides the seafood dishes that combine well with sparkling wines and refreshing full-bodied whites, the choice becomes refined, with the monkfish rice or the superb lobster rice, one of the best dishes I know. Or even a special white to side with a sole or a piece of grouper grilled on charcoal. 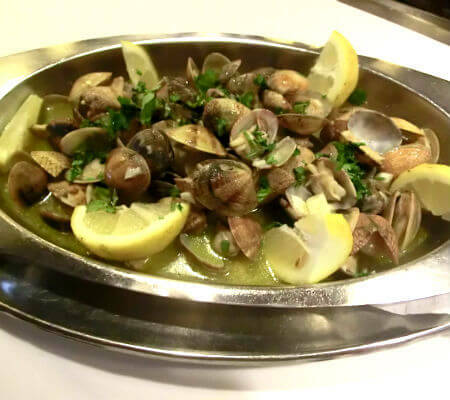 The seafood rice is very traditional of this place, and so are the tasty and plump Bulhão Pato clams [Clams are cooked in white wine and olive oil]. 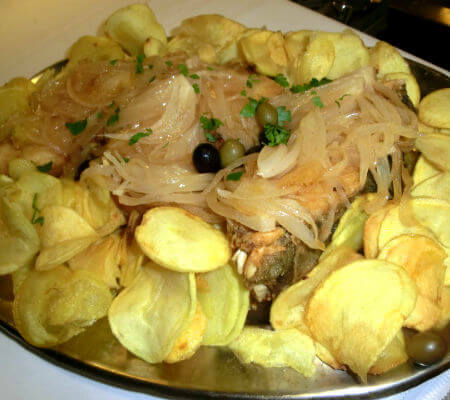 Also on the menu are the codfish meals, especially the Narcisa-style codfish: tall chunks of cod fried to perfection with a lot of fried onion and potato rounds. 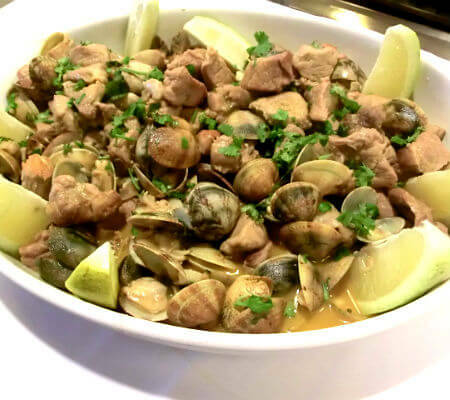 Or even a traditional carne de porco à alentejana [Fried pork cubes and clams with potato cubes]. 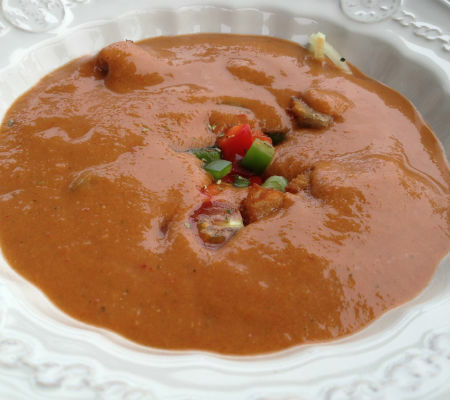 On Saturdays, the tripas à moda do Porto [Boiled tripes with fresh and smoked meats and vegetables.] dish brings in many loyal customers. 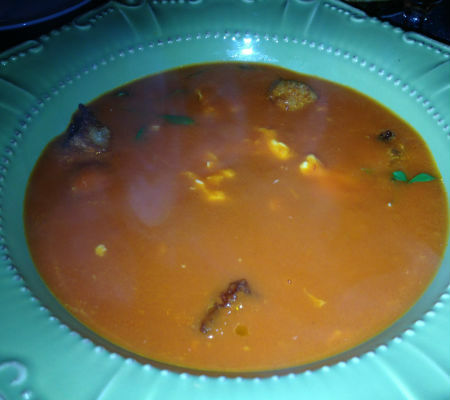 On our last visit, we began with the delicious seafood soup, which had a delicate touch of spices. 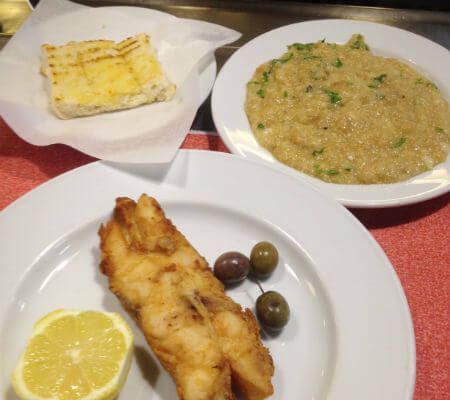 Afterwards, we had a plain fillet of fresh hake with a gorgeous Russian salad (cold salad of boiled vegetables with boiled egg and mayo); then, we ended the meal with john dory in very well-fried thin pieces, accompanied with a gorgeous seafood panada of the fish roe! 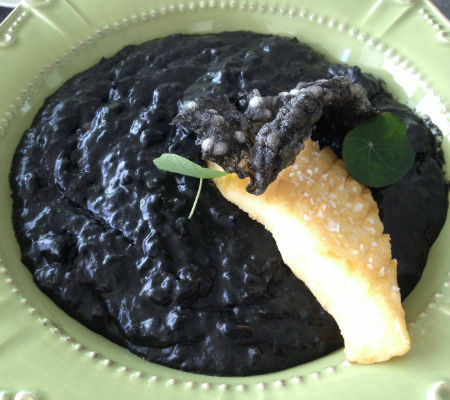 One day, this genuine Minho lady, born in Caminha, decided to devote herself to cooking, a passion that gradually took her over, and is now her whole life. 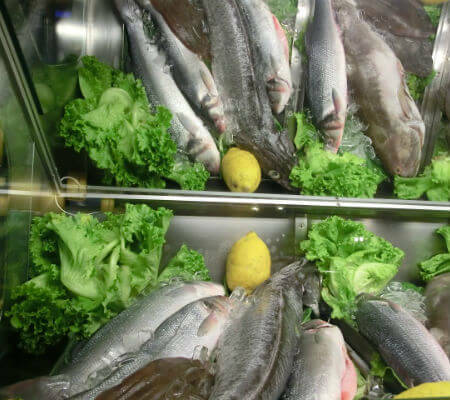 Fishing is, together with agriculture, one of the main sources of income in the district; taking all this into account, Margarida Rego started researching, studying, tasting and trying to get to know products at the higher end. 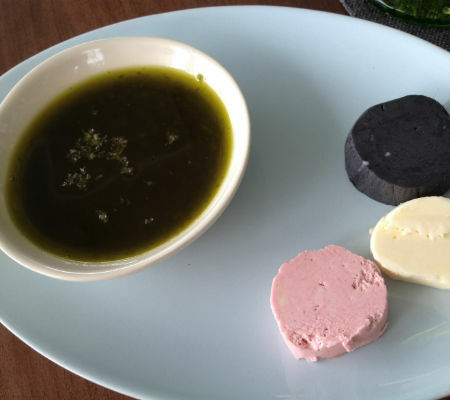 And so she continued creating dishes, making changes and even some provocations, without neglecting the traditional good things from her homeland. She also enjoys meeting her suppliers, some of which are also her friends. 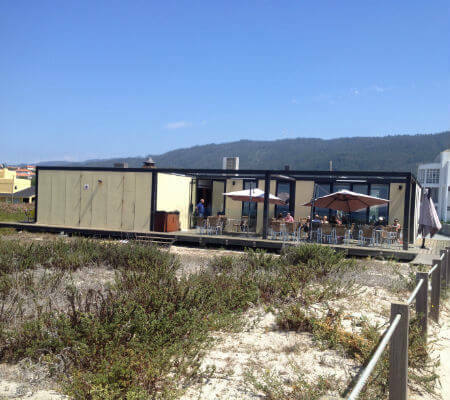 These were the reasons why she embarked on managing a space which isn’t much more than a beach hut, Areia Restaurant Bar, in the beautiful Praia do Carreço, a bit further north of Viana do Castelo. 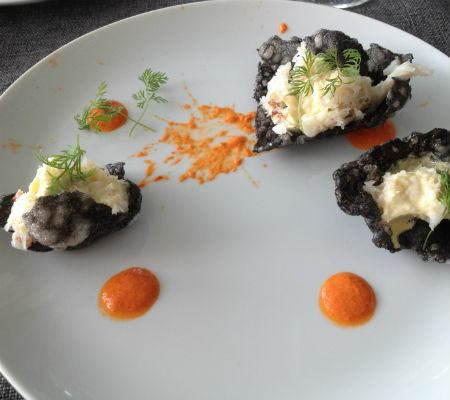 Margarida still keeps the place as a beach hut, where she serves snacks; however she has adapted it – both indoors and the terrace outside – to serve her very unique cuisine, which evolves according to what becomes available, especially products that come out of the sea: sea urchins, red-beak goose barnacles, rock crab, the always excellent bream, – and when it’s tastier – the very octopus, john dory, sea bass, prawns in their season, and a real passion for seaweed from that very same sea, and which she cooks superbly. 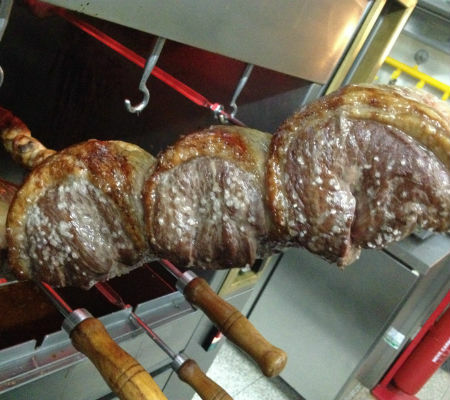 The meat as well; either pork, beef of the barrosão or cachena breed, depending on what is available. Besides, there’s all that modern and airy modest space right on the sand, fully invaded by that amazing landscape, and the all-mighty sea in the background. 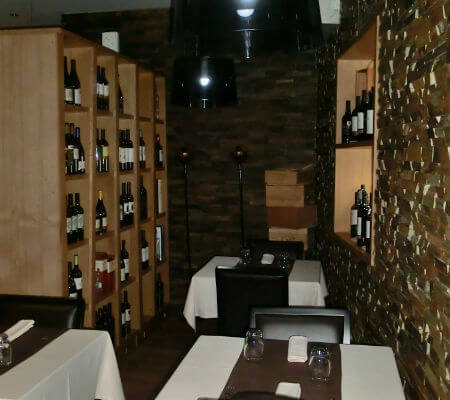 The service is remarkable, with quality staff, who serve you pleasantly and efficiently throughout the meal, including an exquisite wine service. Although it was a bit windy, we decided for the al-fresco area, which turned out right. Bottles were opened after having been kept cool in a frappé, while we drank them. 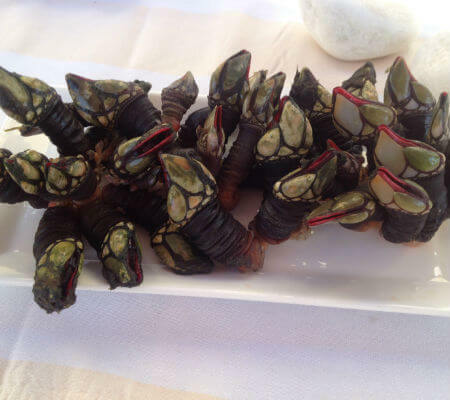 Various kinds of bread were served, with olive oil and different condiments; all of a sudden the percebas (or goose barnacles in the north of Portugal) appeared, absolutely gorgeous! 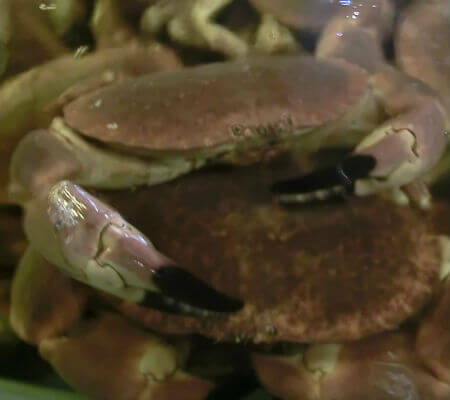 Immediately followed by already opened rock crabs, full of eggs, tasting of the sea. Also tasting of the sea were the ready-peeled sautéed prawns on a bed of delicious seaweed, their antennae were well fried and crunchy; we ate them all. 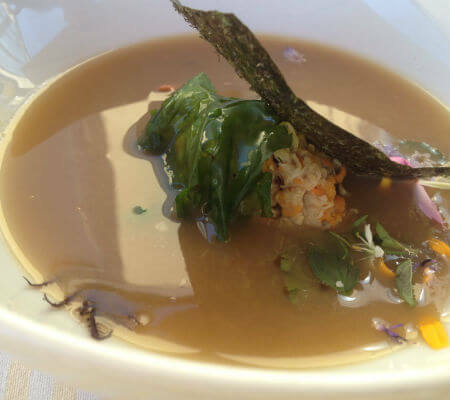 That’s when the first provocation arrived – a rock crab soup. 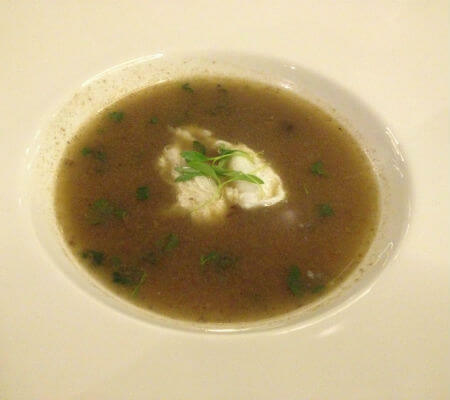 First, they served the dish with its contents, and immediately poured the rock crab broth over them; excellent. The octopus was very tender, served with batata a murro (literally punched baked potato), sautéed cabbage and a very soft red pepper foam – very good. 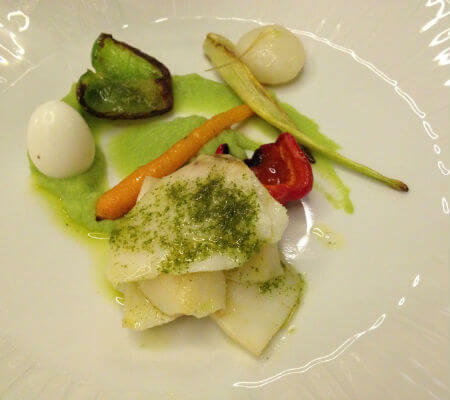 Margarida’s second provocation followed, an excellent john dory fillet on a bed of green beans and various types of seaweed – symbolizing both the countryside and the beach, which you can see on either side – and also a celery and garlic purée. To rinse our palate and prepare for meat, we were surprised with a sea urchin, very refreshing with little bits of strawberry. 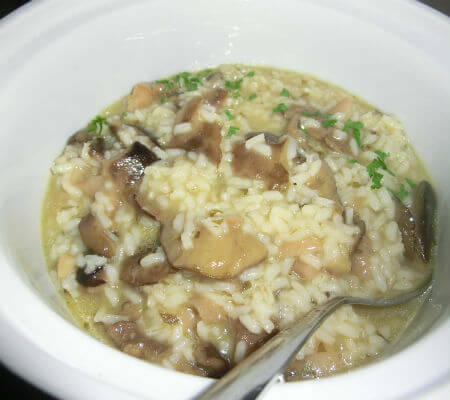 Then it was time to eat meat, or barrosã in this case, it was cooked just right, very tasty, with a side dish of delicious mushroom risotto and a green salad where rocket and purslane stood out. 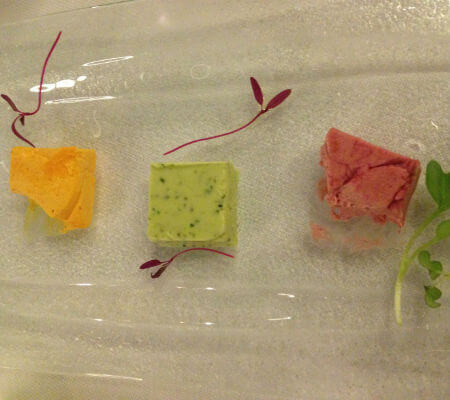 The meal ended with a superb chocolate mousse, sprinkled with… salt flower, and the effect was unbelievable. 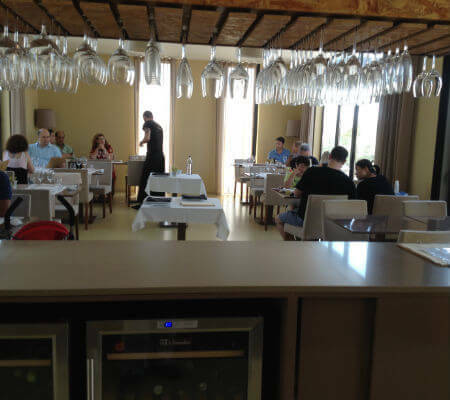 During the meal, we strolled through the António Futuro whites, a modern and appetising young vinho verde by Vale de Ambrães; another verde was already mature, well structured, and consistent; then, the elegance of an Alvarinho by Quinta de Santiago, mineral, saline, and very refreshing. 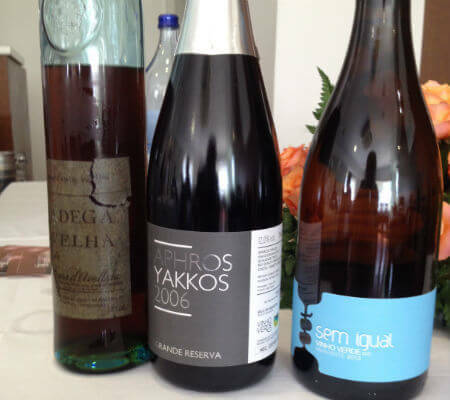 The Ortigão sparkling wine brought along a young and very lively modern Bairrada to prepare us for the right Alentejano: complex, very elegant, well matched with the wood, the Esporão Reserva. 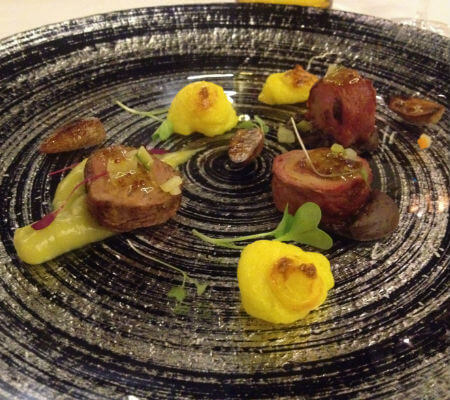 At last, a delicious Quinta da Manoella appeared on the scene, Douro in all its strength. For the last drink, a Port full of tradition, Quinta Seara d’ Ordens LBV 2010, that lingered in the mouth for a long time. 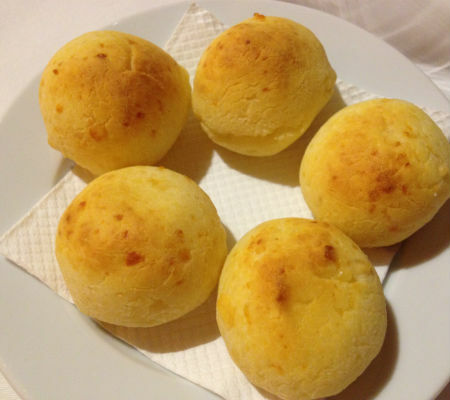 A five-star hotel in Vila Viçosa was the latest news about two years ago and has proven very successful. 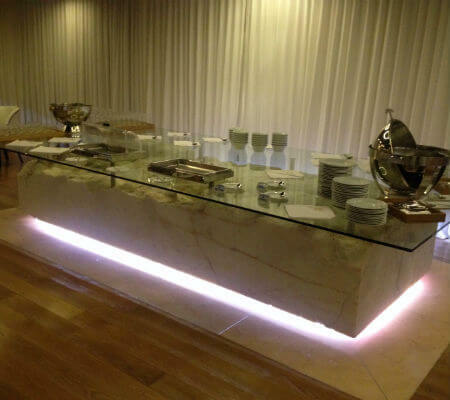 Seeing as it belongs to a family involved in the marble business, it’s only but natural for marble to be the noble raw material most used in the decoration. There’s a touch of marble of different colours and different origins everywhere, conveying a very unique glamour to the space around. Refined and highly comfortable bedrooms and en-suites will offer you an invigorating and peaceful stay. The tranquility of the beautiful Vila Viçosa invites you for a stress-free walk around it, including a visit to the old castle and The Palace of the Dukes of Bragança, an amazing museum, which tells you a bit of the History of Portugal. Afterwards, when you arrive back at the hotel, all the comfort and support are there to help you recover from your walk: outdoor and indoor pool, and a perfectly well-equipped spa. Professional, competent and friendly staff will wait your every need. 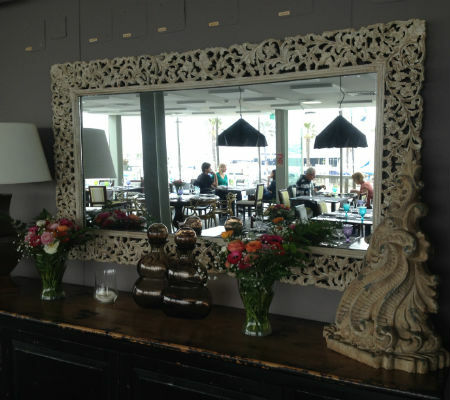 In the morning over a fantastic breakfast, in the afternoon or evening in the bar and, of course, in the restaurant, one of the attractions of this hotel, curiously called ‘Narcissus Fernandesii’. 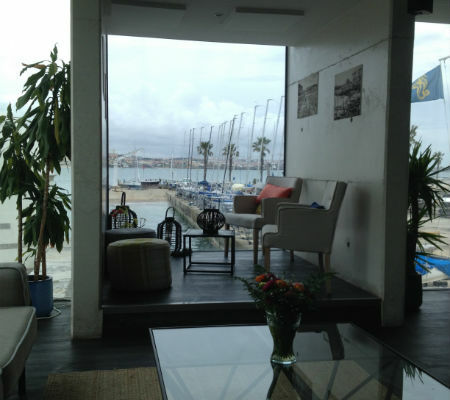 A wide space with two separate rooms and an outdoor terrace looking on the pool. In the main room, wide and elegant, a huge table stands out – a large glass top sits on a gigantic stand made of a single marble slab. 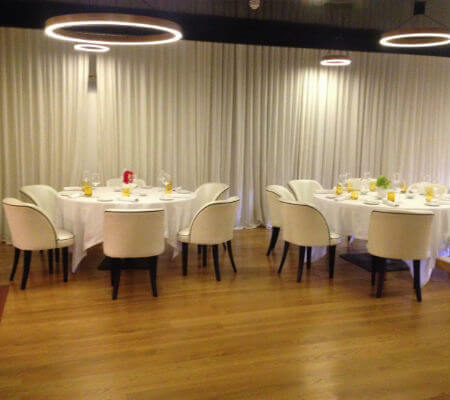 The breakfast items are displayed on it, and it can also host meals served to groups of guests. 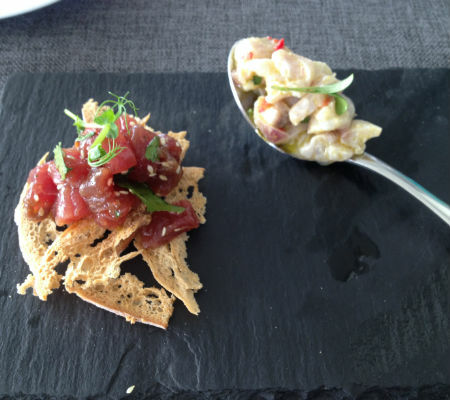 Lighter meals at lunchtime and the à la carte menu for full-course meals in the evening. 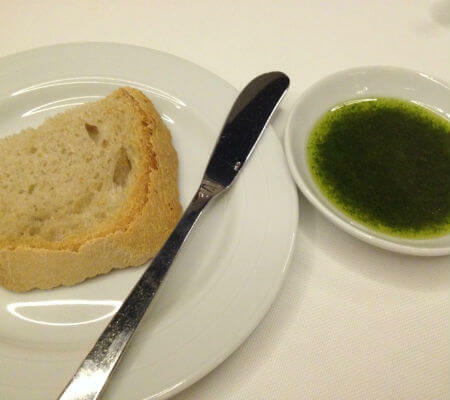 There’s always excellent local bread and olive oil from Alentejo, but also some very tasty butter preparations. 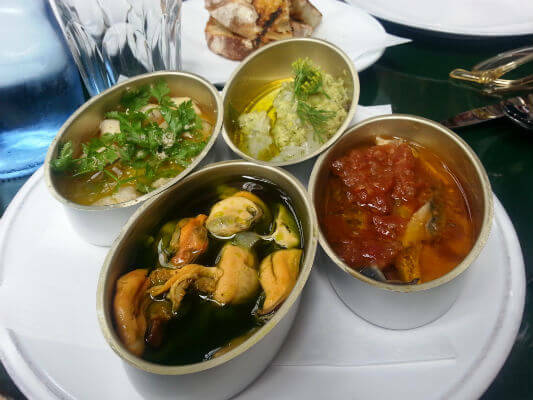 Some appetisers to start with – always very well presented, such as codfish morsels in a mint açorda (spiced, cold broth), farinheira buns, red onion jam, and shoot salad, or partridge pie with fruits of the forest, and sautéed seasonal mushrooms. 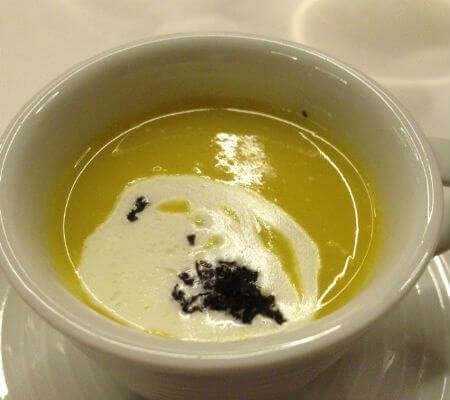 Traditional soups can’t be missing, like pumpkin cream with poached egg and croutons made from Alentejo bread, pumpkin soup with truffle cream served in a cup, and a delicious purslane soup. 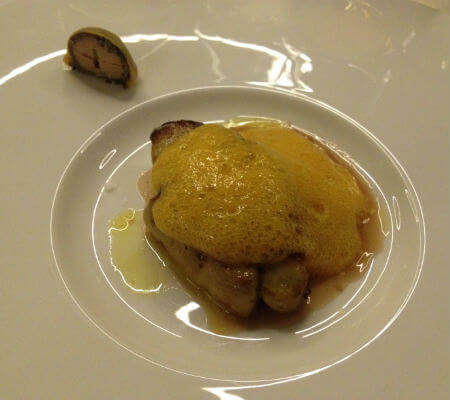 Or a foie gras with a sharon-fruit emulsion, foie bonbon and acorn toast, unbelievable. 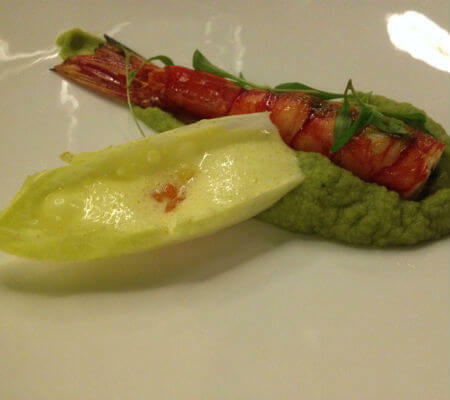 Codfish can’t be missing, like codfish with Galician olive crust over potato à brás and algae purée; even some fish and fresh seafood, like the carabineiro from the Algarve (special large prawn from this region) with cauliflower purée and coriander, endives and lemon emulsion. And the richness of a steer tornedó with foie gras, sautéed vegetables, roast potatoes and spinach cream, or venison smoked in oak and rosemary, with a Madeira wine reduction, broad beans and coriander shoots, quince cream, cauliflower in breadcrumbs and a crunchy presunto (prosciutto) made from beef. 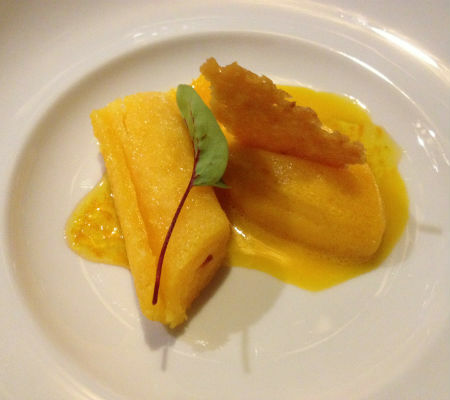 The desserts are fantastic, but the Vila Viçosa orange variations were superb. 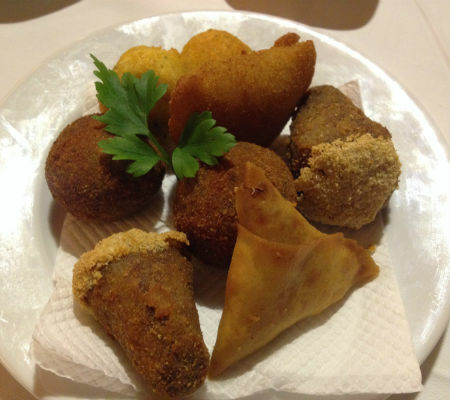 It’s near Felgueiras, and has been practising traditional cuisine for quite a while, even after the required modernisation of the premises. 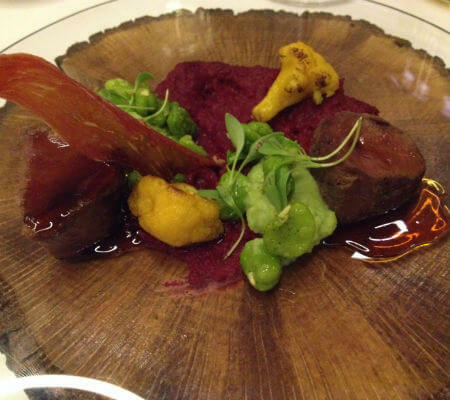 Entirely leaded by Mr. Carvalho, the owner and chef de cuisine with has an undeniable passion for what he does. Brasão it’s a very pleasant space, with two separate dining rooms, both displaying the same care for table layout and for the attentive and professional service. Even though the kitchen is his main post, our host is always running back and forth, ensuring his customers are not neglected, and going from table to table to greet them and find out what they feel like having. He’ll come back to the tables later on, to find out about how they liked it, always wearing a smile and the wisdom of many years handling these products and the kitchen. 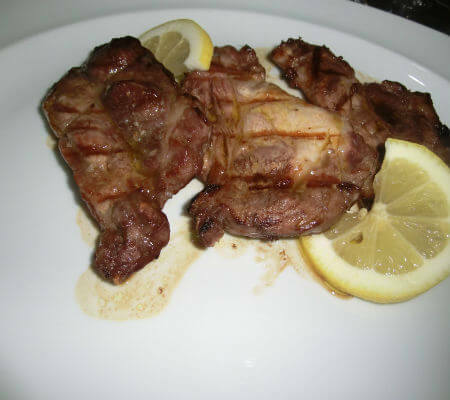 The point is exactly the quality of the products, for only first class ingredients make part of their stock, from fresh fish from the coast to cod, and all the meats: either pork, beef or calf, and mountain lamb, all of which he turns into unbelievable dishes. This excellent professional reveals a restless search for perfection, even when preparing a mere dessert. 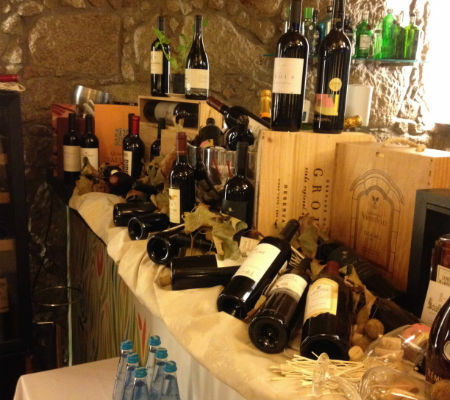 Wine is another of his passions, and real treasures can be found in his well-stocked cellar (just to mention an amazing collection of bottles of aguardente – rum-like liquor or spirit –, about which Mr Carvalho is deeply knowledgeable. 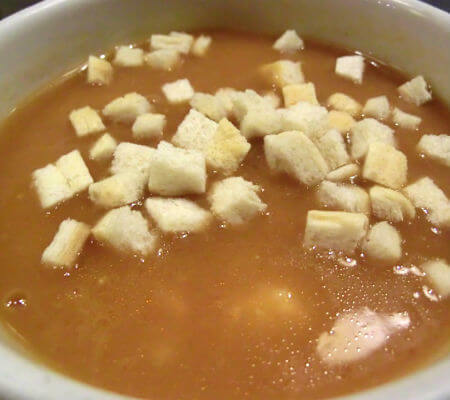 On our last visit, we were served bread and broa (corn-bread), salpicão (pickled-pork sausage) and thinly sliced presunto (salted or smoked ham) while we waited for one of the house specialities: grouper soup. 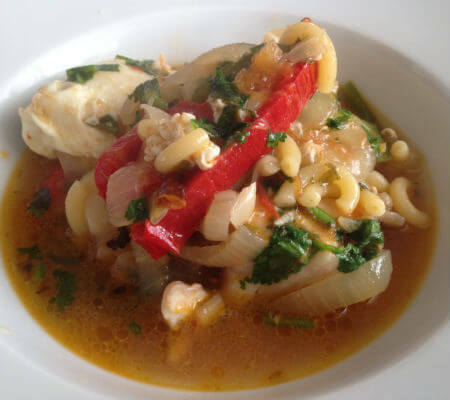 It’s a real tribute to quality, very fresh fish in generous portions, garlic, lots of onion, green and red pepper, and coriander. 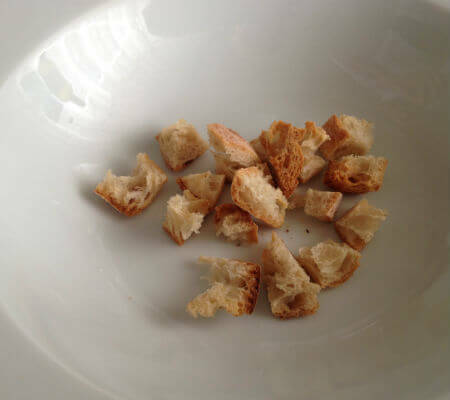 Some toast on a plate, a generous ladle, a bit more steaming broth, an overpowering aroma, and finally voluptuousness, as you eat with your eyes closed. 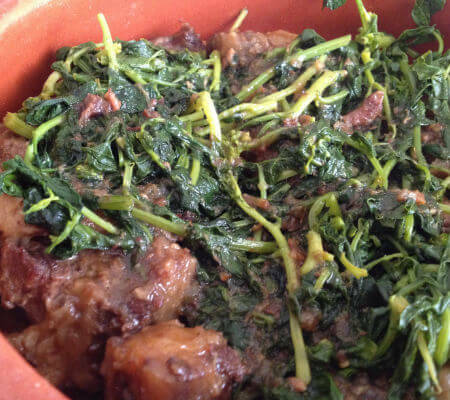 Afterwards, we tasted a superb oxtail stew with greens, which is very hard to describe such was its perfection, texture and flavour; amazing! 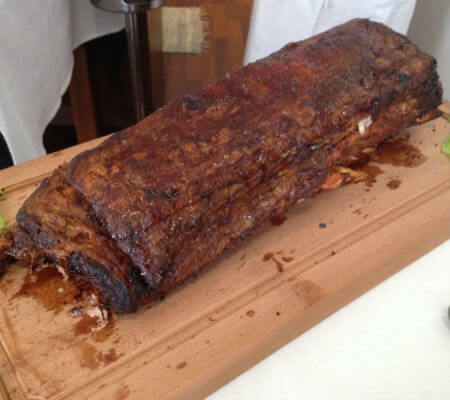 Then, another bestseller usually only available on Wednesdays (or by order): roasted ox spareribs. The slab of baby back ribs is seasoned and roasted in one piece and then carved in front of you, after the coat of fat is removed. 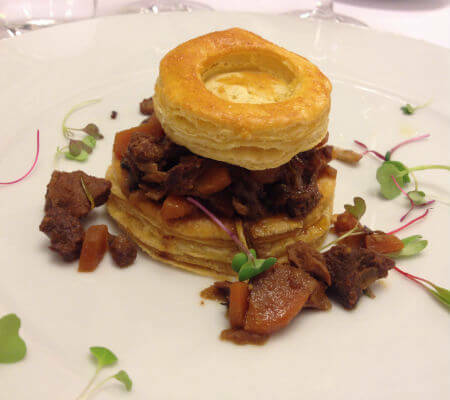 On your plate, you get slices of meat with that tasty layer of fat, crunchy sliced-potato chips, black beans and a sinful oven-baked rice, which also accompanied the oxtail. We are over the moon! 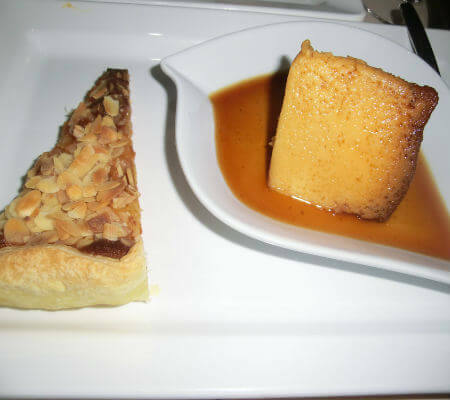 That’s when dessert is served, an ensemble duet composed of toucinho do céu (‘Bacon from heaven’, a rich-custard sweet which includes no bacon whatsoever) and of a fantastic carrot cake: soft, sprinkled with sugar and slices of roasted almonds, pumpkin jam and some spearmint leaves… now this is heaven on Earth! The wines were up to scratch: first we drank a white from the Amarante area, called Sem Igual (Nothing like it); very floral, with notes of citrus and white fruit, a remarkable elegance on the mouth, a beautiful modern wine. To “counterbalance” the meats, no better than a sparkling red made from the Vinhão variety, Afros Yakkos Grand Reserve 2006. Simply fantastic, with very fine bubbles, persistent fruits of the forest, notes of dark chocolate, intense yet simultaneously elegant tannins, and a long lasting finish. 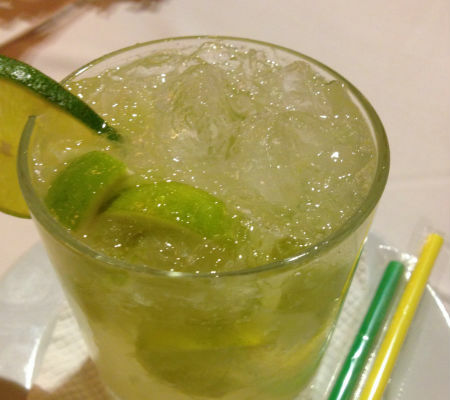 To go along with the dessert, the choice of an old aguardente – really old –, the classic Adega Velha. This one was over 50 years old; beautiful, slightly cooled, with toasted aromas, dried fruits, in a lovely contrast with the sweetness. 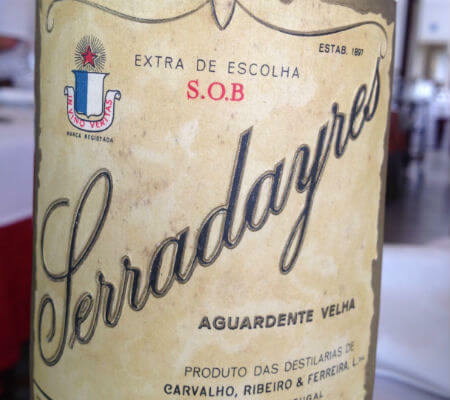 However, a surprise was yet to come, just the way Mr Carvalho’s likes it: another very old aguardente, which I hadn’t seen for 10 years, a Serradayres. 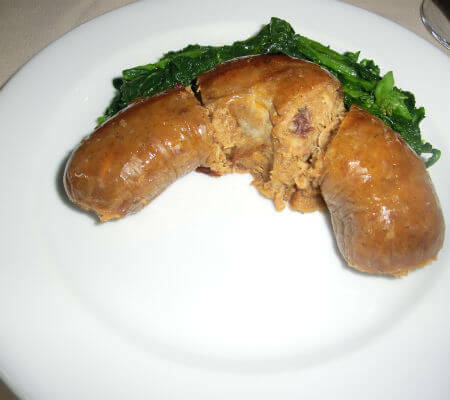 Also over fifty years old, incredibly soft and very elegant, it made a perfect finish for a great meal. 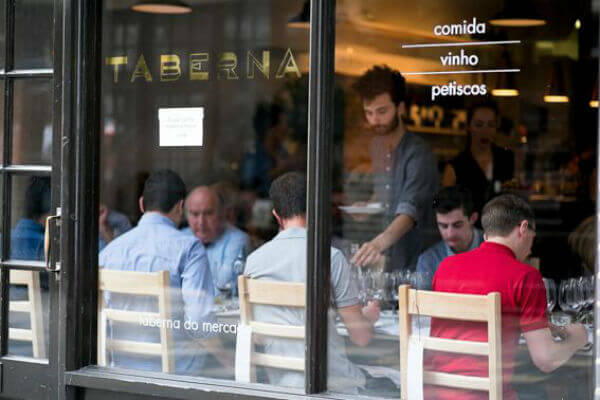 It was a thrill to present a tasting on behalf of the Alentejo Wine Commission at one of London’s hottest new restaurants, Taberna do Mercado. 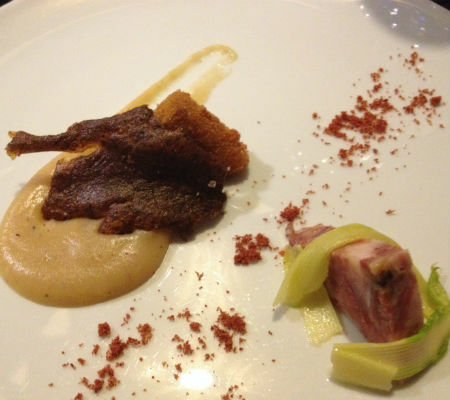 And even more exciting that, not only is its chef/patron Portuguese, so is the food and wine. 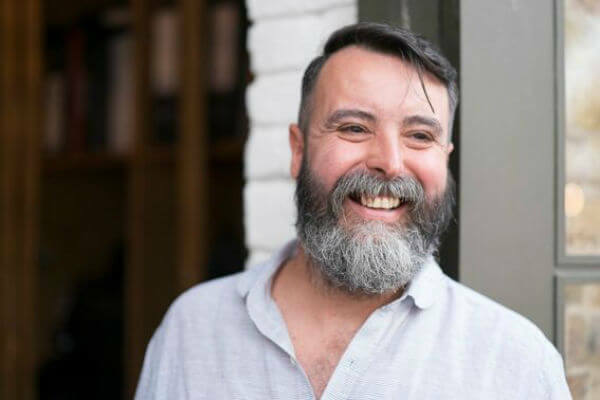 Which may sound a strange thing to say but, thus far, Nuno Mendes’ renown has rested on the eclectic, highly innovative dishes of his previous restaurant, Michelin-starred Viajante, now his American accented menu at celeb hang out Chiltern Firehouse (where he is Head Chef). Fully expecting him to have overcome these challenges, I asked him what had changed since we last spoke. Mendes asked, “did I want the nice answer or the true answer?” Naturally, I said the truth! 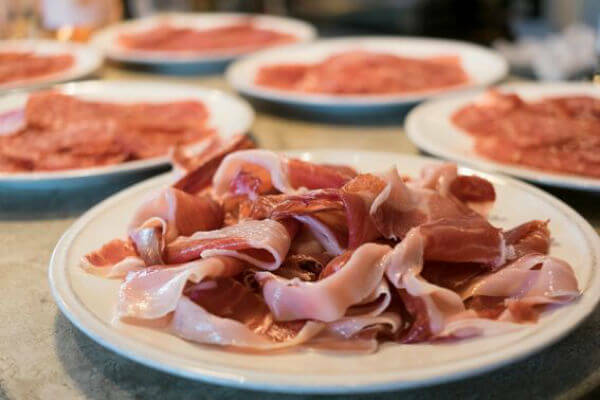 Admitting “it makes me sad,” Mendes remains palpably frustrated that, in the UK, sourcing the very best Portuguese products of which he can be “super-proud” has still proved elusive. 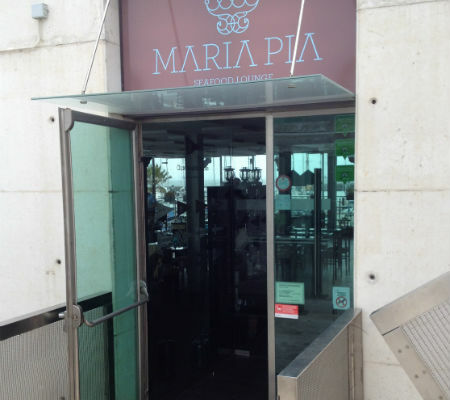 He observed, UK-based Portuguese-owned importers are “mostly used to supplying the local ex-pat community” (as opposed to high-end restaurants with demanding ‘foodie’ customers). It reminds me of a point he made when we first met and emphasised how important it was in his field “to be aware of what’s happening in the food and wine world and to find a way to fit it in other people’s realities.” It’s why, he adds, “I had to walk away” from Portugal when he opened Viajante – the range of products did not fit with his Michelin-starred reality. It was “not amazing,” nor could he count on consistency of supply. The good news? Where he sees Taberna do Mercado as “the portal to tap into Portugal’s great resources,” he tells me “I’m not giving up.” He may be softly spoken and modest of demeanour, but there’s a steely determination in Mendes’ eyes when he reveals his solution. Pointing out “I have many more connections than the importers based here,” (not to mention a Michelin-starred chef’s fastidiousness about sourcing the very best), he plans to set up his own export/import business. After all, his reputation depends on it. 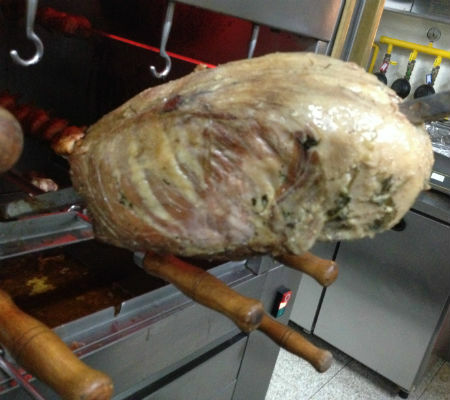 And the stakes are high where, given supply issues, he believes it’s premature for Portuguese food to be touted as the next big thing as The Daily Telegraph recently suggested. It is why he asserts, “now is where the research comes in…we can’t relax, we have to push ourselves and bring in the best…we have to evolve”. There is no room for complacency. Shortly after the tasting, I paused to reflect on Mendes’ comments in relation to Portuguese wine when a journalist asked me why it has yet to really hit the big time. I am pleased to report that the UK has been rather better served by its wine importers, especially Portuguese specialists Raymond Reynolds and Oakley Wine Agencies who have helped their producer clients navigate the highly competitive UK market with aplomb. But if, like Mendes, I am to be Portugal’s critical friend, the truth is that far too many Portuguese producers have yet to find a way to fit into the realities of the UK market, which is widely acknowledged as the most competitive in the world. What’s more, ‘cellar palate’ (becoming too habituated to your own wines, including flaws) can be a problem. It’s why the most successful Portuguese winemakers themselves keep visiting the UK to understand where their wines best fit (and to benchmark them against the competition). It also helps to ensure that they are still seen and heard in our crowded, noisy marketplace. Happily, all eight producers whose wines I showed in my master-classes at Taberna do Mercado are represented in the UK. But there is still work to be done where Alentejo has forged it reputation in the UK on a bedrock of great value, fruity, approachable reds. The next step is to raise the profile and appreciation of its premium, terroir-driven red and white wines among fine wine lovers (white wines now represent around 20% of wines from Alentejo). It was a challenge to which I gladly rose. My selection of wines was accompanied by Mendes’ contemporary take on petiscos (how’s that for fitting them into the realities of the UK market) and followed by an excellent tasting of Alentejo olive oils presented by Teresa Zacarias of Casa do Azeite. Here are my notes on the wines, together with some background on what individuates this diverse selection in terms of terroir and winemaking. As you’ll see, the Alentejo is not as flat or unremittingly hot as regional stereo-types would have you believe. What’s more, all the grapes were hand-picked. 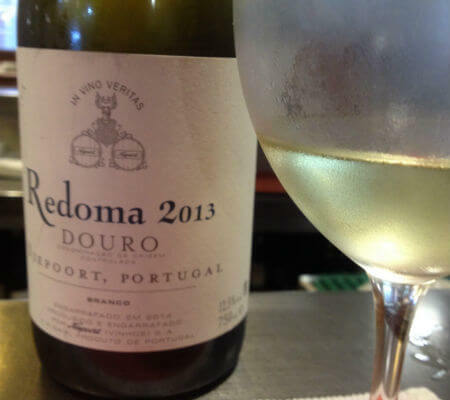 Terroir: this single varietal Antão Vaz comes from Vidigueira, one of Alentejo’s eight DOC sub-regions. Despite being the southernmost, it has a long tradition of producing white wines. Why? It’s all to do with the lie of the land, specifically, the Vidigueira fault, a 50km west-facing escarpment known as the Serra do Mendro which marks the border between the Upper and Lower Alentejo. Rising to 420m it traps cool and humid Atlantic winds which cool the region with overnight fogs. Cold air also descends from the Serra do Mendro at night. What’s more, when southern winds bring clouds, the escarpment causes a cloudburst (rainfall). For winemaker Catarina Vieira, this is what accounts for Vidigueira’s “very mineral, elegant and fresh wines that can age very well.” She believes that the sandy soils also enhance the minerality of her Antão Vaz, which is sourced from her best, dry grown, low cropping 24 year old vines. Terroir: this blend of 62% Antão Vaz and 38% Arinto comes from Évora, another DOC sub-region, this time in the Alto/upper Alentejo. The fruit was sourced from three parcels of Cartuxa’s oldest vineyards on slopes which rise to 300 metres above sea level. Planted in 1980 on brown granitic soils, the vines were dry grown. Winemaking: for this fuller-bodied, more traditionally-styled white, the fruit was hand-picked later and in three stages for complexity (12, 18 & 19 September). Following de-stemming and crushing, a portion of the grapes was left in contact with the skins prior to fermentation. Sixty-seven percent of the wine was fermented and aged on the lees for 12 months in French oak barrels (60% new) with batonnage for body, complexity and ageing potential. The balance was aged in stainless steel (to enhance fruitiness) with lots of batonnage (for body). There was no acidification. Terroir: this rosé made from 100% Touriga Nacional is from Arraiolos in the Évora district of Alto Alentejo. For winemaker Pedro Pereira, the key to the freshness of Monte da Ravasqueira’s range lies in the estate’s very pronounced diurnal temperature variation. Even in the hottest months of July and August when temperatures might hit 40 degrees centigrade, at night the temperature can fall below 10 degrees. Cool nights help the grapes to retain acidity better; it’s good for aromatics and structure too. Gonçalves attributes this strong diurnal to the amphitheatre-like topography of the vineyard (all 45 hectares are planted on slopes rising to 270m), together with the surrounding forest and dams. Though supplemental irrigation is required, clay-limestone soils have good moisture retention while granite outcrops seem to enhance minerality/freshness, as in the Dão. 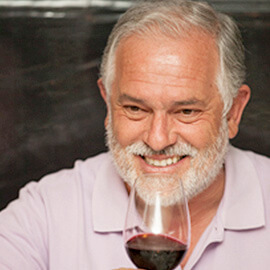 Winemaking: where Gonçalves’ style revolves around “freshness + complexity (a matrix of flavours) + varietal character + intensity + concentration,” he sourced fruit from five different parcels (by row orientation-exposure, soil type and canopy management) and hand-harvested the grapes on different days, ranging from 8 September to 27 September. The grapes were kept in refrigerated containers between two to 20 days at two degrees for concentration and to enhance aromatic potential and fruit. Two parcels were pressed directly to new French oak barrels and naturally fermented with batonnage on full solids. The other three were first settled and inoculated with yeast prior to transfer to new French oak barrels on the second day of fermentation. 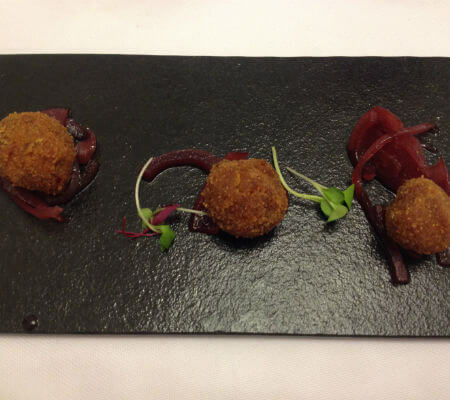 All five parcels were aged in barrel on the lees for six months with light batonnage for the first 2 months. Terroir: this, my first red, is from the Alto/Upper Alentejo but is a blend of DOC sub-regions. Esteban sources the Aragonês and Touriga Nacional (40% and 20% of the blend respectively) from a dry grown 15 year old vineyard in Évora at 300m on clay/limestone soils. The balance is a mix of varieties from a dry grown 30 year old field blend vineyard in Portalegre, the Alto Alentejo’s northernmost sub-region. It’s not just the northerly location which accounts for Portalegre being Alentejo’s coolest, wettest area. The Serra de São Mamede mountain – at over 1000m, the highest point in southern Portugal – provides serious elevation (up to 800m) and poor granitic soils. 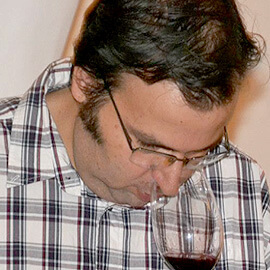 Where Esteban’s aim is “to make a fresh wine, with character but appealing at the same time,” she looks to Portalegre for freshness and austerity, while Évora provides the heat which the winemaker believes Touriga Nacional and Aragones need to show their potential (though she emphasises “I have attention to pick with only 13 or 13% alcohol). Winemaking: the grapes are hand-picked and naturally fermented (with no acidification) in small stainless steel temperature controlled lagares. I very much like the fact that Esteban has put the emphasis squarely on the fruit and freshness – this wine is unoaked. Terroir: Herdade de São Miguel is located in the Redondo sub-region (a DOC) of the Alto/Upper Alentejo. For Alexandre Relvas junior the Serra d’Ossa hills (which rise to 650 metres) shelter Redondo’s vineyards from northerly and easterly winds and furnish cold, dry winters to offset the hot, sun-drenched summers. His vineyard is located at 400m on low yielding clay/schist soils which produce concentrated, small berries. This wine is a blend of 80% Alicante Bouschet, 15% Aragonez and 5% Cabernet Sauvignon from 13 year old vines. Winemaking: hand harvested fruit is totally de-stemmed and undergoes a 48 hour cold soak prior to fermentation in open stainless steel lagares with automatic pigeurs for softer extraction, a bit of natural oxidation too “to help fix colour and tannins from the beginning” says Relvas. It was aged for 12 months in 400 litre French oak barrels (50% new). Tasting note: an intense nose of blackcurrant and bramble fruit with a touch of vanillin oak and dusty schist undertones, which follow through on a succulent palate with lovely freshness. Though only five percent of the blend, the Cabernet is quite evident in flavour profile (blackcurrant with a hint of mint) and fine, gravelly, mineral tannins. It does not have the concentration or complexity of the (more expensive) wines which followed, but it’s well balanced and persistent. Very well made, indeed wears its 15% abv lightly. Terroir: This single varietal Touriga Nacional is from Estremoz in the Borba sub-region (a DOC) of the Alto/Upper Alentejo. It is north of Redondo and just north of the Serra d’Ossa, which offers a little protection from the warm south winds. Where Quinta do Mouro is at 420m, elevation also tempers the climate, as do plunging night-time temperatures which, says winemaker Luis Louro, can be 20 degrees lower than in the day “especially at the later stages of maturation, and fogs are common.” Schist soils and dry-farmed vineyards also account for the very structured, ageworthy and characterful style of Mouro’s reds. Sourced from “a very good” Douro vineyard in 1998, the Touriga Nacional was grafted onto Castelão vines which had been planted in 1989. Winemaking: hand-harvested fruit was partially de-stemmed, leaving around 10% whole bunch for a bit more structure and fresher flavours. The grapes were foot-trodden in lagares and underwent a two day cold soak prior to starting fermentation. It finished fermenting in stainless steel tanks with temperature control and, after pressing, was aged for 12 months in new 300 litre French oak barrels. Winemaking: hand harvested grapes are picking grapes at night and early in the morning. The grapes are partially de-stemmed (50% whole bunch) and start co-fermenting (naturally) in marble lagares with foot treading. For Ramos the advantages of the lagares include a higher area of contact between the liquid and the solid part of the must, gentle homogenisation of the must (because a thinner cap is formed compared to the normal tanks) and the aesthetics of the local marble (which, incidentally Mendes has used for his table tops at Taberna do Mercado). The final third of the fermentation is completed in stainless steel vats with the benefit of temperature control. 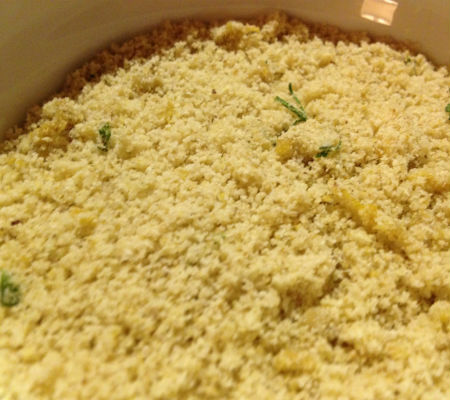 The post-ferment maceration usually lasts about two weeks. The wine is then matured for 18 months in French 225 litre oak barrels (two thirds of which are new). Terroir: this blend of around 70% Alicante Bouschet and 30% Trincadeira comes from one of the region’s most established players, Herdade do Mouchão, which has belonged to the same family since 1874. Mouchão was the first vineyard to be planted to Alicante Bouschet and the current vines trace their genetic origin back to this original 19th century stock. Mouchão is in Sousel to the north of Borba in the Alto/Upper Alentejo. The Alicante Bouschet is sourced from several parcels near the winery at around 230m and ranging between 10 and 30 years old. Located on a delta between two small rivers, the sandy topsoil is well-drained but the deep clay beneath retains the humidity which allows for a balanced maturation, freshness and good acidity. The hallmarks of Mouchão’s great ageing potential. The thinner skinned Trincadeira benefits from being planted on higher, well-drained ground at around 400m. Winemaking: this most traditional of wines is hand picked and fermented in the old winery’s original stone lagares with 100% stems. It is then aged in large old 5,000 litre toneis for two to three years. It spends a further two to three years in bottle before being released.